George Nelson Gordon (1819-1880) first appeared in Colborne censuses in 1861, but he had purchased property in town in 1858 and that is probably when he first became a resident. He was born in Quebec in 1819 and was one of the nine children of James Gordon (1791-1872) and Elizabeth Fox (1793-1872). There was a James Gordon listed in the 1842 Cramahe census as a farmer living on Lot 13, Concession 3, who might have been George’s father, but “James Gordon” is not an unusual name and this could easily have been another man. Our James Gordon was living in the Port Perry area in 1861 and a document quoted but not referenced in one Ancestry.ca genealogy states that he “was a local preacher on the Whitby circuit for many years”. George Gordon was a tinsmith. He purchased Reid Lots 154 and 59 in 1858. Lot 154 is where the Colborne Home Hardware store now stands. It was part of the parcel of land now bounded by King, Percy, and Church Streets and Victory Lane that was received, along with other properties, by Joseph Keeler III from his father Joseph Abbott Keeler in 1854. The first reference specifically to Reid Lot 154 was when John Whitelaw (1823-1873), a Cobourg tinsmith, bought it from the Bank of Montreal in 1855. There is no record of how the Bank got it from Joseph Keeler. Perhaps they were just acting as his agents, or perhaps there was an earlier transaction and the record is missing. In any case, the lot was already referred to as the “tin shop lot” in the Land Office record of Whitelaw’s purchase. This suggests that there was a tin shop there before Whitelaw’s involvement; because it isn’t likely that the Land Office record would have used the phrase simply because Whitelaw was planning to build a tin shop there. Whitelaw apparently never actually resided in Colborne. He was still a resident of Cobourg when he sold the property to Colborne tinsmith Milo A. Hawley (ca. 1835-1920) in 1856. Hawley then sold it to George A. Hawley (?-?) of Norwood, another tinsmith, in 1857. George Hawley relinquished his rights to the property to George Gordon in a quit-claim grant in 1858. The other property purchased by George Gordon in 1858 was Reid Lot 59, which he bought from Joseph Keeler III. This lot is on the northwest corner of Cedar and Percy Streets (now 25 Percy Street). This is now, and probably was then, a residential lot. Gordon’s business was on Lot 154 and his home was probably on Lot 59. This purchase of a residence is the primary evidence for suspecting Gordon arrived in Colborne in 1858. Of course, it is always possible he lived here for some time prior to that, working for the previous owner(s) of the tin shop. He probably wasn’t living here prior to 1853, however, because his first two children were born in Cobourg in 1852 and 1853. One can imagine Gordon strolling to work every morning along the (then dirt) Percy Street past the Methodist Church. George Gordon married Sophia Tryphena Webster (1825-1910) in Wentworth County, Ontario in 1851. This was an historical county, now subsumed into the city of Hamilton. Sophia was the daughter of Joshua Webster (1793-1878) and Rebecca Merriman (1792-1876). Rebecca Merriman was the daughter of early Cramahe settler Joel Merriman (1760-1832). This makes Sophia the niece of Hiram Merriman (1791-1861), who was a Trustee of the Methodist church when the land was purchased for a chapel, on what is now Church Street, in 1830. The Merrimans are another of the candidates for prominent Methodist families. James Wilmot Gordon (1852-1941) was born in Cobourg. He would have been six years old when the family moved to Colborne. He worked as a clerk in Colborne in 1871, but by 1881 he was a barrister living in Brighton. He continued to live in Brighton through the 1901 census, but sometime between then and 1911 he moved to Toronto. He was listed in 1911 as a civil servant working for the provincial government. In the 1921 census he was an “inspector”, still working in a government office. Unfortunately, the censuses don’t elaborate. Inspector of what? James Gordon married Elizabeth Grace (“Lizzie”) Newcombe (1853-1929) in Cramahe Twp. in 1878. James was already a resident of Brighton and was a barrister by this time. The Gordons had five children, all born in Brighton: George Newcombe (1879-1949), Harry Charles (1882-1963), Ralph Wilmot (1884-1973), Alfred Ernest (1886-1972), and Edith Grace (1890-1967). James died in 1941 and is buried in Mt. Pleasant Cemetery, Toronto. George Newcombe Gordon went on to be a Member of Parliament from 1921 to 1925 and Minister of Immigration and Colonization briefly in 1925. In 1900, while Bessie was marrying Ivanowski, Frederick Gordon was living with her adopted father John Moser in Manhattan. Sigismund and Bessie Ivanowski moved to New York City in 1902, and he spent the rest of his career there. By 1910, Frederick Gordon had moved to New Jersey, and he died there in 1924. Mary E. Gordon (1860-?) married James E. Gray (1860-? ), a banker from Brighton, in 1886. In the 1891 and 1901 censuses, they were living in Harriston, Wellington Co., west of Toronto. His occupation in 1891 was listed as “bank agent” and in 1901 as “bank manager”. No children were listed in either census. George Arthur Gordon (1861-?) was a clerk in Colborne in 1880 and by 1883 he was a hardware merchant. Since his father had branched out into hardware sales by 1871, I think George Arthur Gordon probably clerked for the family business, then took it over when his father died in 1880. He is not present in any 1891 census, but by 1901 he and his family were living in Toronto, and he was working as a salesman. In 1921 he was a salesman for the Metallic Roofing Company. The “tin shop lot” went to his sister Kate in 1907. George Arthur Gordon married Margaret Blair Young (1860-?) in Toronto in 1885 and had two children, both born in Colborne: Frederick (1883-?) 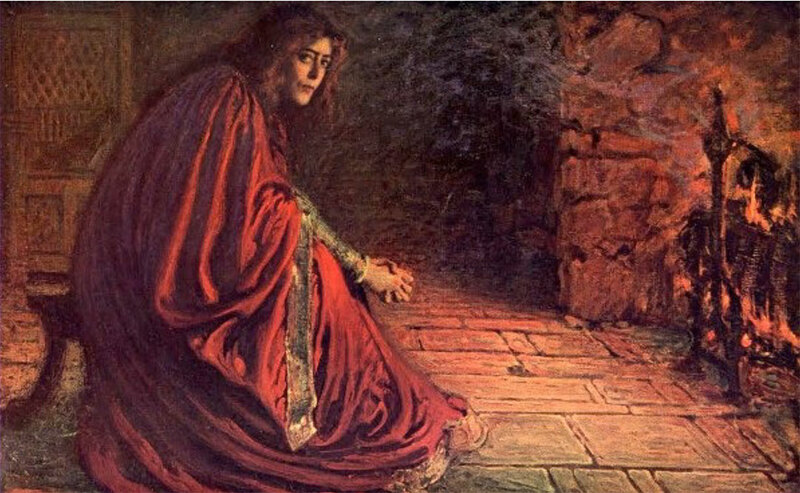 and Alice (1886-?). There are no available details concerning Frederick, but Alice married James King Ingram (1886-?) in Toronto in 1912. Ingram, a widower, remarried in 1919, so Alice died sometime before that date. Interestingly, there is no mention of Henry Albert (“Harry”) Gordon (ca. 1863-1883) in any genealogy of George Nelson Gordon, but the 1871 and 1881 censuses listed him with the family. And his name is imbedded among George Nelson’s children, not tacked on the end, as usually happened when the person in question was a nephew, grandson, etc. So it seems that Harry was another of George’s sons. He lived to be only 20 years old, dying in Colborne in 1884 of “inflammation of the bowels”. I see no indication that he ever married. In 1881 he was working as a Post Office clerk. Kate S. Gordon (1865-? ), George’s second daughter, married John E. Crowle (ca. 1861-? ), “gentleman” of Colborne, in 1886. There is no documentation of children and the Crowles cannot be found in any censuses outside of Colborne, where Kate is listed for 1871, 1881, and 1901. John is absent from all three of these. Kate inherited Reid Lot 154 (the “tin shop” lot) in 1907 and sold it in 1912. The last child was Joshua Dwight Gordon (1867-? ), sometimes called “Joshua” in documentation, and sometimes “Dwight”. He was present in Colborne censuses for 1871 and 1881 but disappears until 1901, when he was working as a Hardware dealer in Craig, Nebraska. He remained in Craig for the 1910 and 1920 censuses. Joshua Gordon married Lucilla Lenna D. Fitch in 1892, and had a single child, Bessie M. (1895-?). It isn’t known where the marriage took place, but since Lucilla was born in Indiana, it’s likely that it happened after he left Canada (consistent with his absence from Colborne in 1891). So, of George Nelson Gordon’s family, he himself, his wife, his son Harry and his daughter Kate lived out their lives in Colborne. The rest of his children moved away, James to Brighton before 1878, Frederick to New York in 1883, Mary to southwestern Ontario (perhaps with a short stay in Brighton) probably in 1886, George to Toronto in about the 1890’s, and Joshua to Nebraska probably in the 1880’s. Reid Lots 2A and 3 are across the road from, and just south of, the Northumberland Veterinary Hospital. Lots 119, 125, and 126 are all on the north side of Church Street West. Lot 230 is on the southeast corner of King Street East and Victoria Streets. Lots 366 and 367 are on the west side of Division Street, just south of the Grand Trunk (now Canadian National) Railway tracks. Reid Block B is the part of the chunk of property bounded by Park Street, Ontario Street, Percy Street, and Cedar Street (which no longer exists west of Percy) after you exclude the properties immediately along Ontario and Percy Streets: basically the interior part of the chunk. One of the properties along Percy Street backing on Reid Block B is Reid lot 59, where it can be hypothesized that the Gordons lived. This Lot was owned by George Nelson Gordon until 1875, when he sold it to James M. Merriman (another of his wife’s uncles). This was probably just a legal fiction, though, because Merriman immediately turned around and sold it to Sophia, his niece and George’s wife. Sophia Gordon continued to own the property, and live there, for the rest of her life. G. N. Gordon’s tin shop appears in an historic photograph of Colborne’s main street. 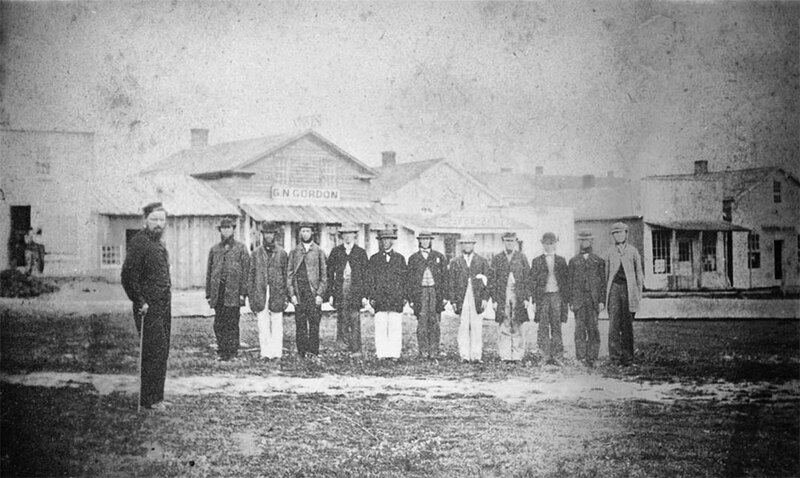 In the background G. N. Gordon’s tin shop can be seen behind what one assumes is the local militia being drilled.